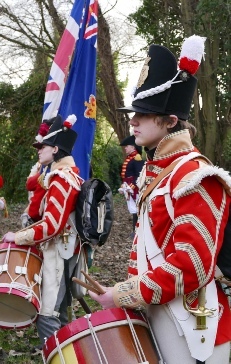 The military communications for line regiments for our period were mainly dependent upon the drums. (Only the Light Infantry and Light Divisions used Bugles). Not just to save the voices of the officers and NCO’s but by necessity, because of the sheer scale of noise and numbers involved. If you can imagine the size of an encampment hosting a battalion of up to 1000 men, the only way to convey orders to all at the same time is by making the maximum possible volume and taking the message around the encampment. The noise of battle makes it impossible for shouted orders to be heard, consequently every order has it’s individual drum call. whole hand about two and a half inches form the top (or more if required - as drum sticks are not all of the same weight) similar to grasping a sword or stick when going to play back-sword. The left is to be held between the thumb and fore-finger of the left hand close in the hollow. The top towards the wrist leaving the top of the stick as much out of the hand as the other resting in it, resembling a pen when going to write, in this case with the first joints of the second and third fingers". 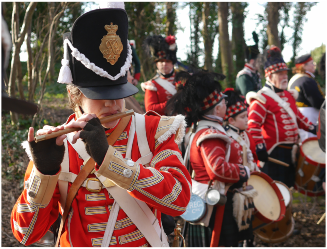 If we need a bugle, and we do at times, the 44th also boasts 2 of the best in Napoleonic Re-enactment. Handy for raising and lowering the flag for the Brigade when nobody else has the manpower to do the job! We are always looking to increase the size of our musical section. It is not just drummers that we require for military duties, Fife players of course an add another dimension - both on the march but also of course as part of a musical entertainment when in camp and at ease. If you feel you can show a talent (Or are happy to learn) - then get in touch. The art of Beating the Side Drum by Sam Potter Drum Major in the Coldstream regiment of Footguards.